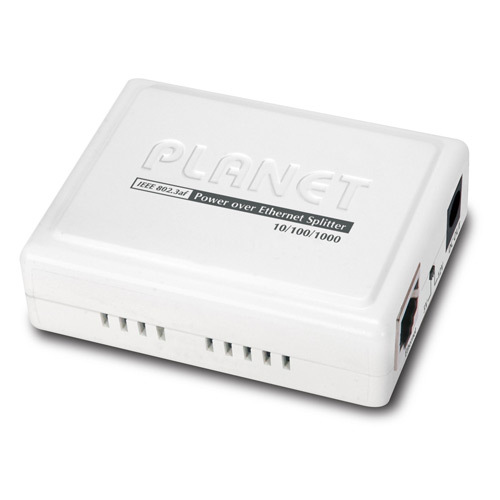 With cost saving and power management feature, PLANET POE-152S is a 10/100/1000Mbps Power over Ethernet splitter ideal for quick PoE environment deployment. The POE-152S can split the 48V DC over the Ethernet cable into 5V/12V DC power output. Working with the IEEE 802.3af power source equipment (PSE), the POE-152S frees the device deployment from restrictions of power outlet locations, which eliminates the costs for additional AC wiring and the installation time. In the PSE and POE splitter installation, when the PSE inserts DC Voltage into the CAT 5 cable, it allows the cable between the PSE and POE-152S to transfer data and power simultaneously. The PSE combines the Ethernet digital data with power over the twisted pair cables as an injector, and the POE-152S, the splitter, divides the digital data and the power into two outputs. The maximum distance between the PSE and POE-152 is 100 meters. With IEEE 802.3af Power over Ethernet network being installed, the system administrator only has to use a single RJ-45 Ethernet cable to carry both power and data to each device. The POE-152S brings the benefits of cost saving as well as ease of networking planning and higher reliability. Furthermore, upon any IEEE 802.3af networking, the POE-152S can make the connection while migrating or splitting the power and the Ethernet digital packets. The POE-152S provides two kinds of PoE power output options through DIP switch, including 5V / 2A and 12V / 1A DC for PoE power output in one unit. Having the capability of IEEE 802.3af standard and controlling the power system of your networking devices, the POE-152S can co-work with PLANET or the third party 802.3af PoE injector hub to build PoE network applications such as VoIP network in the office. Besides, the POE-152S can be directly connected to the third party 802.3af PoE devices installed 100 meters away, which brings users more convenience in PoE deployment. For a place where is hard to find the power inlets, the POE-152S and the POE-152 as a pair should provide the easiest way to power your Ethernet devices such as PLANET ICA-HM320, the Internet camera on the ceiling, or PLANET WAP-3000PE, the wireless access point installed on the roof of the building. It can be applied in the same way as PLANET VIP-254PT, the IP phone used in the office or home. 2010-05-28 2.0 Initial release for Hardware version 2.0.